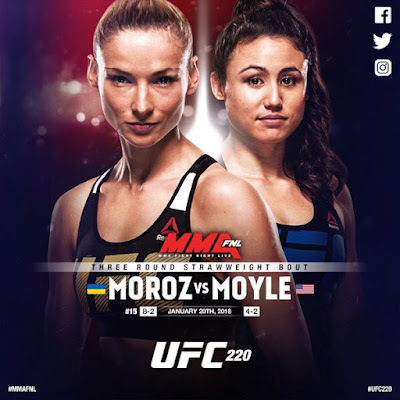 Nolan King of MMA Today reported yesterday that Maryna Moroz vs Jamie Moyle has been added to UFC 220 Jan. 20 at the TD Garden in Boston. This fight will be at Strawweight. I expect it to air on the prelims. Maryna is from the Ukraine. Her record is 8-2 and her UFC record is 3-2. She is mainly a boxer and her husband trains her. He is also a boxer. She seems to be one of those fighters destined for the midcard. If she beats Carla Esparza in her last fight, she gets a big boost up the ladder because of course Carla is a former champ. But she didn't do it. Neither fighter looked very good but Maryna was worse. So it's back to the prelims for Maryna. Jamie is very popular on the internet mostly because of her looks. I've seen her in Invicta, TUF 23 and now the UFC and she hasn't shown me much so far. In her last fight, she looked terrible losing to Viviane Periera. She did nothing against a mediocre fighter. Jamie was training at Syndicate MMA in Las Vegas. In Sept. she moved to Team Alpha Male in Sacramento. She is originally from Michigan and I think it was expected that she would be on the Detroit show. It remains to be seen if the move helps her. She needs something because she hasn't looked good. Maybe she will find it at TAM. The fighter I have seen doesn't belong in the UFC.